CBS Consulting joins Scottish Financial Enterprise. 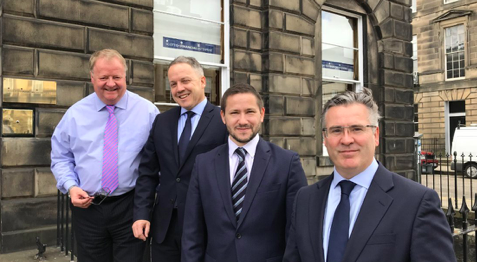 Edinburgh-based firm CBS Consulting has joined Scottish Financial Enterprise to expand their network and support the representative body’s work in strengthening and promoting financial services. CBS Consulting was founded in 2006 by a team of former big-four consultants specialising in strategy execution and change management within the UK financial services Industry. They manage and deliver technology, regulatory and operational change across UK Financial Services – from core product platforms and new digital channels to payments and risk solutions, as well as the associated integration and business change involved. Eddie Curran, CBS Consulting Managing Director, said: “As a leading strategy execution and change management specialist, exclusively focussed on UK financial services, we are encouraged by the fresh approach that SFE has taken to be more inclusive and progressive in helping to grow and develop the sector and we recognise how this approach can benefit our wider economy – for all sizes of business. “As the sector undergoes a seismic shift in response to changes in customer expectations, an expansive regulatory regime, increased competition and a host of new fintechs to partner with, we are genuinely excited about the future prospects for financial services in Scotland and the role SFE will play in this. Graeme Jones, Scottish Financial Enterprise Chief Executive, said: “Scottish Financial Enterprise is thrilled to welcome CBS Consulting to our expanding membership including global businesses headquartered in Scotland to small, locally-based support companies drawn from all areas of financial services. “Scotland is a leader in pensions, investment, banking, professional services and asset servicing with the strength of the sector lying in its diversity. Add to that firms like CBS Consulting, who provide support to the UK retail banking, asset management and life and pensions sectors, and it’s easy to see why Scotland is the second most complete cluster of financial services in the UK after London, employing over 141,000 people. Scottish Financial Enterprise is the representative body for Scotland’s financial services industry, with members ranging from global companies headquartered in Scotland to small, locally-based support businesses. For more information on SFE go to sfe.org.uk, follow our LinkedIn page and Twitter. CBS consulting manages and delivers technology, regulatory and operational change across the UK financial services industry. For more information on CBS Consulting go to www.cbsconsulting.co.uk and LinkedIn.